Creamy Mozzarella Shrimp Pasta recipe is a delicious amalgamation of creamy pasta with chewy shrimps and is quite sumptuous. This mouth-watering main dish recipe can be savored in lunch as well as dinner and is sure to leave you craving for more. 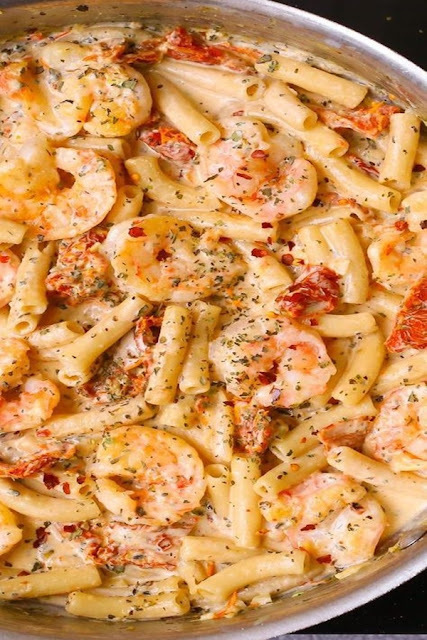 This Continental recipe is made from penne pasta and shrimps, coated in a creamy tomato sauce that is spiced up with basil, red chili flakes and paprika. You can serve this non-vegetarian recipe with toasted garlic bread and a beverage of your choice on occasions like kitty parties, potlucks, picnics and game nights to make them even more special. Prepare this easy recipe for your family and watch them go for a round two of this luscious delight! Place a deep-bottomed pan over medium flame and boil water in it. Add pasta along with salt in the boiling water and let it boil. When pasta becomes tender, drain the water and keep the pasta aside. Sprinkle 1 tablespoon olive oil over the pasta so that it doesn't become to sticky. Next, on a chopping board, chop the garlic and grate the mozzarella cheese. Meanwhile, place a non-stick pan over medium flame and heat 2 tablespoon olive oil in it. Now, add chopped garlic and cook it for few seconds. When it turns soft, add shrimps in the pan and cook for 2 minutes. Turn over the shrimps, using a spatula, and make sure the shrimp is golden in colour. Sprinkle salt to season shrimps. Once cooked, remove them transfer them carefully to a plate, leaving behind oil in pan. Now, place the same pan over medium flame and add sun-dried tomatoes in it. Saute it on medium flame and let the tomatoes become soft. Meanwhile, in a bowl, combine ¼ cup milk with ¼ fresh cream and mix them well to get a creamy texture. Once done, add the creamy mixture to sun-dried tomatoes and boil it for a minute. Stir constantly to get a thick consistency. While it’s still boiling, add shredded mozzarella while stirring the mixture. Make sure the cheese melts completely with the mixture and looks thick. Once the cheese melts, season it with salt, basil, chili flakes and paprika. Stir on a low flame and add salt to the mixture. Mix the spices well in the creamy mixture. Lastly, add boiled pasta in the creamy sauce and stir on a medium flame. When done, add cooked shrimps and stir well to combine all the shrimps with pasta-cream. Cook them for few seconds and toss it well. Make sure that pasta and shrimps are well coated with the tomato-cream sauce. Once done, transfer the pasta in a plate and serve it hot to enjoy!